Franklin D. Roosevelt was in his second term as governor of New York when he was elected as the nation’s 32nd president in 1932. With the country mired in the depths of the Great Depression, Roosevelt immediately acted to restore public confidence, proclaiming a bank holiday and speaking directly to the public in a series of radio broadcasts or “fireside chats.” His ambitious slate of New Deal programs and reforms redefined the role of the federal government in the lives of Americans. 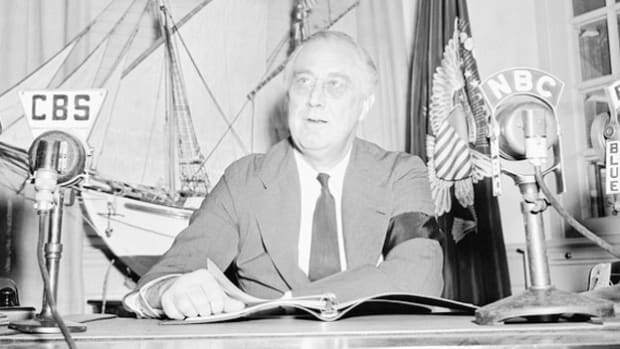 Reelected by comfortable margins in 1936, 1940 and 1944, FDR led the United States from isolationism to victory over Nazi Germany and its allies in World War II. 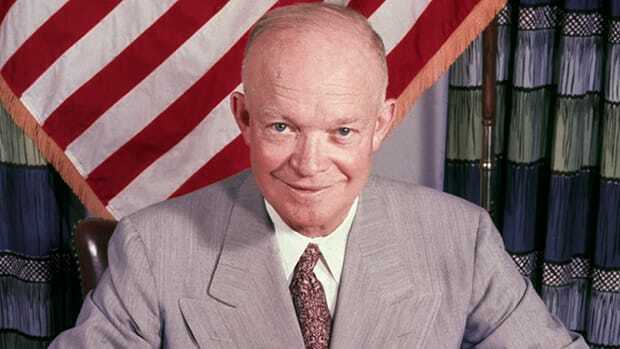 He spearheaded the successful wartime alliance between Britain, the Soviet Union and the United States and helped lay the groundwork for the post-war peace organization that would become the United Nations. The only American president in history to be elected four times, Roosevelt died in office in April 1945. 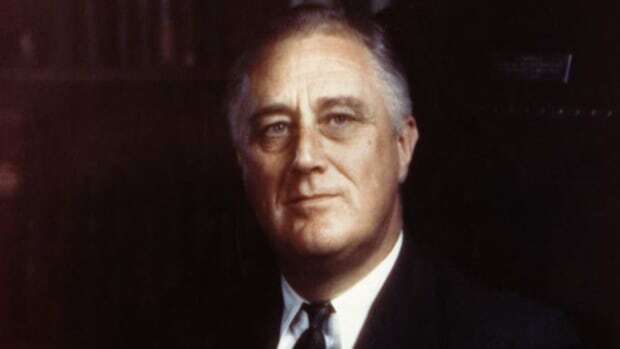 Born on January 30, 1882, on a large estate near the village of Hyde Park, New York, Franklin Delano Roosevelt was the only child of his wealthy parents, James and Sara Delano Roosevelt. 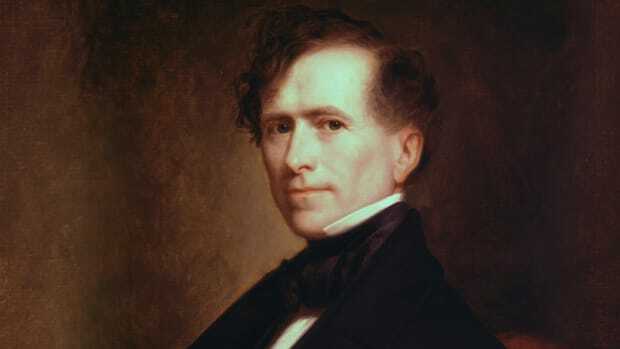 He was educated by private tutors and elite schools (Groton and Harvard), and early on began to admire and emulate his fifth cousin, Theodore Roosevelt, elected president in 1900. While in college, Franklin fell in love with Theodore’s niece (and his own distant cousin), Anna Eleanor Roosevelt, and they married in 1905. 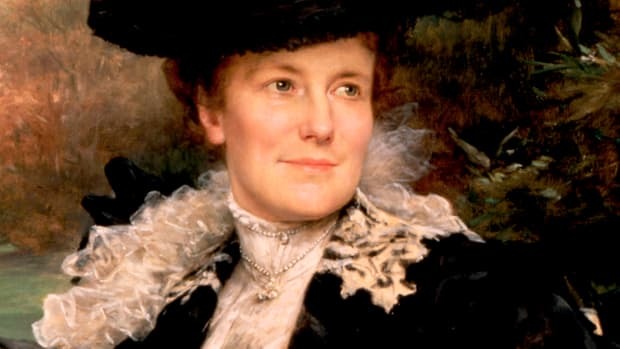 The couple had a daughter, Anna, followed by five sons, one of whom died in infancy. Did you know? 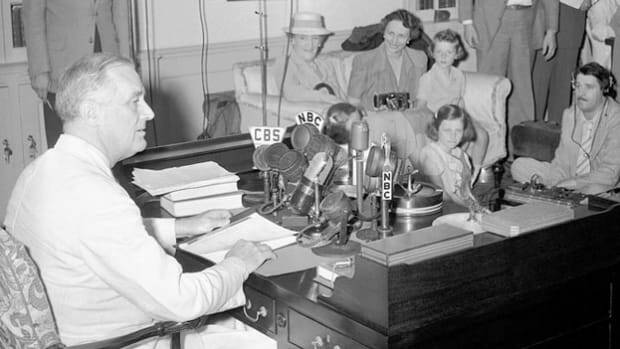 Encouraged by his wife, Eleanor, FDR appointed more women to federal posts than any previous president; he also included black Americans in federal job programs (though they remained largely segregated). 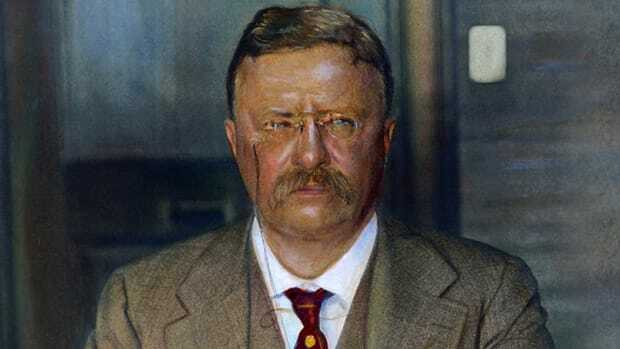 Roosevelt attended law school at Columbia University and worked for several years as a clerk in a Wall Street law firm. In 1910, he entered politics, winning a state senate seat as a Democrat in the heavily Republican Dutchess County. 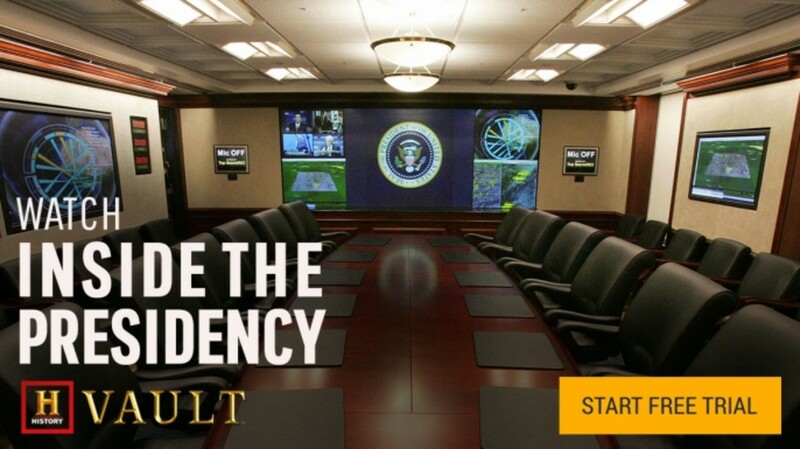 In 1913, President Woodrow Wilson named Roosevelt assistant secretary of the U.S. Navy. He would hold that post for the next seven years, traveling to Europe in 1918 to tour naval bases and battlefields after the U.S. entrance into World War I. With the support of his wife and his longtime supporter, the journalist Louis Howe, Roosevelt began to return to public life, issuing statements on issues of the day and keeping up a correspondence with Democratic leaders. Eleanor Roosevelt spoke publicly throughout New York State, keeping her husband’s reputation strong despite his illness; she also organized the women’s division of the Democratic Party. In 1924, Franklin made a triumphant public appearance at the Democratic National Convention to nominate New York’s Governor Alfred E. Smith for president (though Smith lost the nomination and the Democrats lost the general election). He nominated Smith again in 1928, this time successfully, and at Smith’s urgings agreed to run for governor of New York. Smith lost to Herbert Hoover, but Roosevelt won. Governor Roosevelt grew more liberal in his policies as New York (and the nation) sank deeper into economic depression after the stock market crash of 1929. In particular, he set up the Temporary Emergency Relief Administration (TERA), which aimed at finding jobs for the unemployed, and by 1932 TERA was helping nearly one out of every 10 families in New York. Roosevelt began the momentous first 100 days of his presidency by closing all banks for several days until Congress could pass reform legislation. He also began holding open press conferences and giving regular national radio addresses in which he spoke directly to the American people. The first of these “fireside chats,” about the banking crisis, was broadcast to a radio audience of some 60 million, and would go a long way toward restoring public confidence and preventing harmful bank runs. After passage of the Emergency Banking Relief Act, three out of every four banks were open within a week. 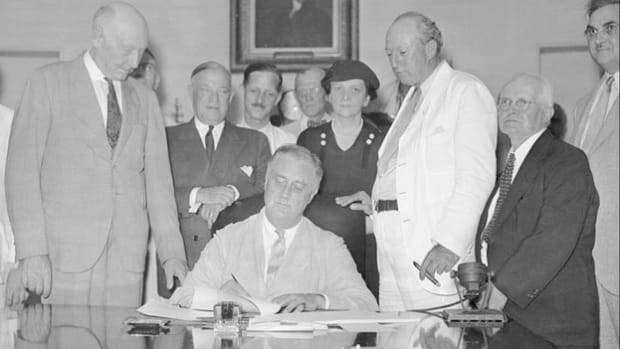 Other key pieces of legislation during FDR’s first “Hundred Days” created some of the most important programs and institutions of Roosevelt’s New Deal, including the Agricultural Adjustment Administration (AAA), the Public Works Administration (PWA), the Civilian Conservations Corps (CCC) and the Tennessee Valley Authority (TVA). In addition to programs aimed at providing economic relief for workers and farmers and creating jobs for the unemployed, Roosevelt also initiated a slate of reforms of the financial system, notably the creation of the Federal Deposit Insurance Corporation (FDIC) to protect depositors’ accounts and the Securities and Exchange Commission (SEC) to regulate the stock market and prevent abuses of the kind that led to the 1929 crash. In 1935, after the economy had begun to show signs of recovery, Roosevelt asked Congress to pass a new wave of reforms, known as “Second New Deal.” These included the Social Security Act (which for the first time provided Americans with unemployment, disability, and pensions for old age) and the Works Progress Administration. The Democratic-led Congress also raised taxes on large corporations and wealthy individuals, a hike that was derisively known as the “soak-the-rich” tax. Controversial but extremely popular with voters, Roosevelt won re-election by a huge margin in 1936 over Governor Alfred M. Landon of Kansas. He faced opposition from the Supreme Court over his New Deal programs, and proposed an expansion of the court that would allow him to appoint one new justice for every sitting justice 70 or older. After heated debate, Congress rejected this “court-packing” scheme, handing FDR the biggest setback of his career. Nonetheless, the Court abruptly changed direction, upholding both the Social Security Act and the Wagner Act (officially the National Labor Relations Act). Labor unrest and another economic downturn in 1937 hurt Roosevelt’s approval ratings, but the crisis had largely passed by the following year. Republicans gained ground in the midterm congressional elections, however, and soon formed an alliance with conservative Democrats that would block further reform legislation. By the end of 1938, as support for the New Deal was waning, Roosevelt faced a new looming challenge, this time on the international stage. As early as 1937, FDR warned the American public about the dangers posed by hard-line regimes in Germany, Italy and Japan, though he stopped short of suggesting America should abandon its isolationist policy. 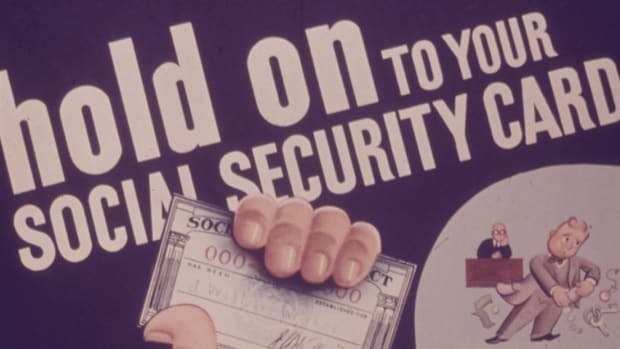 After World War II broke out in September 1939, however, Roosevelt called a special session of Congress in order to revise the country’s existing neutrality acts and allow Britain and France to purchase American arms on a “cash-and-carry” basis. Germany captured France by the end of June 1940, and Roosevelt persuaded Congress to provide more support for Britain, now left to combat the Nazi menace on its own. Despite the two-term tradition for presidents in place since the time of George Washington, Roosevelt decided to run for reelection again in 1940; he defeated Wendell L. Wilkie by nearly 5 million votes. Roosevelt increased his support of Great Britain with passage of the Lend-Lease Act in March 1941 and met with Prime Minister Winston Churchill in August aboard a battleship anchored off Canada. 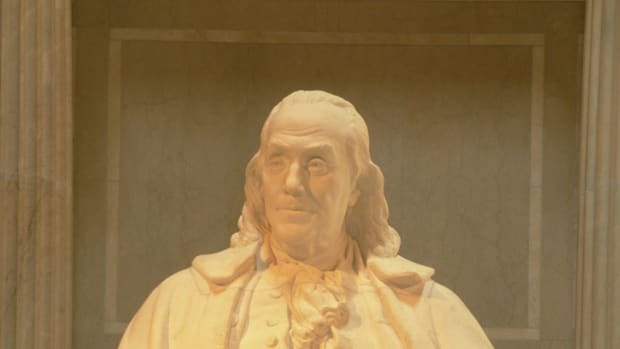 In the resulting Atlantic Charter, the two leaders declared the “Four Freedoms” on which the post-war world should be founded: freedom of speech and expression, freedom of religion, freedom from want and freedom from fear. On December 8, 1941, the day after Japan bombed the U.S. naval base at Pearl Harbor, Roosevelt appeared before a joint session of Congress, which declared war on Japan. The first president to leave the country during wartime, Roosevelt spearheaded the alliance between countries combating the Axis, meeting frequently with Churchill and seeking to establish friendly relations with the Soviet Union and its leader, Joseph Stalin. Meanwhile, he spoke constantly on the radio, reporting war events and rallying the American people in support of the war effort (as he had for the New Deal). In 1944, as the tide of war turned toward the Allies, a weary and ailing Roosevelt managed to win election to a fourth term in the White House. The following February, he met with Churchill and Stalin in the Yalta Conference, where Roosevelt got Stalin’s commitment to enter the war against Japan after Germany’s impending surrender. (The Soviet leader kept that promise, but failed to honor his pledge to establish democratic governments in the eastern European nations then under Soviet control.) The “Big Three” also worked to build foundations for the post-war international peace organization that would become the United Nations. After Roosevelt returned from Yalta, he was so weak that he was forced to sit down while addressing Congress for the first time in his presidency. In early April 1945, he left Washington and traveled to his cottage in Warm Springs, Georgia, where he had long before established a nonprofit foundation to aid polio patients. On April 12, Roosevelt suffered a massive cerebral hemorrhage; he died later that day, and was succeeded in office by his vice president, Harry S. Truman.